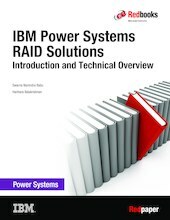 This IBM® Redpaper™ publication given an overview and technical introduction to IBM Power Systems™ RAID solutions. The book is organized to start with an introduction to Redundant Array of Independent Disks (RAID), and various RAID levels with their benefits. A brief comparison of Direct Attached Storage (DAS) and networked storage systems such as SAN / NAS is provided with a focus on emerging applications that typically use the DAS model over networked storage models. The book focuses on IBM Power Systems I/O architecture and various SAS RAID adapters that are supported in IBM POWER8™ processor-based systems. A detailed description of the SAS adapters, along with their feature comparison tables, is included in Chapter 3, "RAID adapters for IBM Power Systems" on page 45. The book is aimed at readers who have the responsibility of configuring IBM Power Systems for individual solution requirements. This audience includes IT Architects, IBM Technical Sales Teams, IBM Business Partner Solution Architects and Technical Sales teams, and systems administrators who need to understand the SAS RAID hardware and RAID software solutions supported in POWER8 processor-based systems. Power Systems has a RAID solution for you!